Beverly Nelson, a Bishop’s Committee member of St. Jude’s, said that one Saturday a young woman who lives off the grid came out of the shower with tears steaming down her cheeks. Beverly was concerned that the water might have been too hot and asked if she was okay. It was with the Episcopal Diocese of Hawaii's "Commission on the Mission Beyond the Church" funds and St. Jude's own outreach fund-raising that the congregation of St. Jude was able to build and open the public health shower, and then staff it, along with other community volunteers. The shower folks can hang out, dry off and join in a hot lunch provided and served by the folks at St. Jude’s . That’s not all. Now there is a large medical van parked in the St. Jude parking lot. 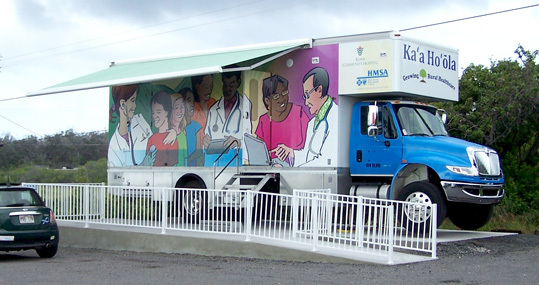 The van, Ka’a Ho’ola, is provided by the Kona Community Hospital, while St. Jude’s provides the electricity and a designed concrete slab with ramp and waiting area. The free public clinic is usually open Mondays, Tuesdays and Thursdays on the first two weeks of each month. A nurse practitioner is on duty to perform tests, give school physicals, give free immunizations and write prescriptions when needed. At this time there are no other clinics, doctors offices or pharmacies in Ocean View. St. Jude’s gets high marks from the residents of Ocean View for sharing their Wi-Fi connection from the church campus. A new resident in Ocean View was so pleased with that, because while she and her husband were building a new home, they could finally communicate with family back on the mainland, instead of having to wait the three months for installed home internet service, that they joined the Church! They said their children call St. Jude’s the patron saint of Wi-Fi. Many families in the area home school their children and the Wi-Fi connection allows them to use the online teaching programs to enhance their homeschooling efforts. Children going to the public schools stop and use the Wi-Fi to complete homework assignments. What a blessing for many in the area to be able to keep in touch with family and friends and provide their children with a better education. Each October, November and the first half of December volunteers from the church meet each Friday to make and fill stockings with gifts for the Keiki Christmas party. They also provided books for the children to pick out as gifts. The first year they provided the books one little girl was astonished that she got to pick out three books and that she could keep them. She picked out her three books, sat down on a big rock and read all three books, then she brought them back and asked if she could trade them for ones she hadn’t read – of course she got new books and maybe a couple extra. St. Jude’s is under contract with the County to provide a home for their Senior nutrition program. Other community programs use the church at no cost, this includes: dog spay and neuter clinics, a wide variety of 12-step group meetings, 2 Marshallese Churches, Hannah’s Makana Ohana Hula, Brownies, Hawaiian Language Class - all serve to round out the 7-day-a-week outreach of this small mission Church on the southern tip of the Big Island. Each quarter of the year they have a fund raiser…food, music and fun, (Mardi Gras, Cinco de Mayo, 4th of July, Oktoberfest, Plant Sale...) and half of the proceeds are ear-marked for different non-profit service groups. 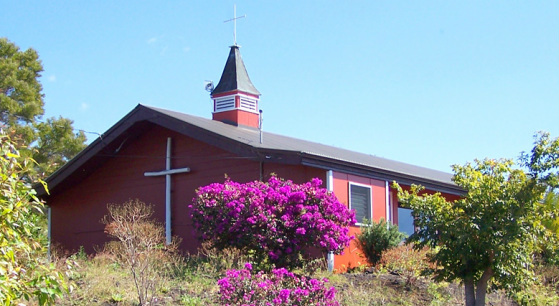 St. Jude donated some of those earnings to the St. Columba Mission replant on the Hamakua Coast. Hot showers, a health clinic, lunch, free wi-fi, quarterly distribution of funds, are just some of the ways the Gospel of Jesus is being practiced by the congregation of St. Jude. You know the folks are there to make a difference to and for the “least” of the Kingdom of God.